The R-PLEX Human A2M Antibody Set includes a matched capture and detection antibody pair and calibrator for the quick and easy measurement of A2M in biological samples. R-PLEX products leverage MSD’s electrochemiluminescence technology for better sensitivity and a larger dynamic range than traditional ELISAs. R-PLEX matched antibody sets enable the development of singleplex and multiplex immunoassays. Individual assays may be developed using MSD avidin- or streptavidin-coated plates. Custom multiplex assays with any combination of R-PLEX analytes, as well as R-PLEX plus U-PLEX analytes can be developed on U-PLEX MULTI-SPOT plates. To learn more about the advantages of R-PLEX products click here. 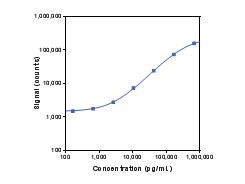 Calibration curve for the R-PLEX Human A2M Antibody Set was assessed and representative data is presented below. Description - Alpha-2-macroglobulin (A2M, Alpha-2-M, CPAMD5) is the largest non-immunoglobulin protein present in plasma and a major representative of the alpha-macroglobulin family, which includes complementary proteins C3 and C4 as well as pregnancy zone protein (PZP). A2M is a 720 kDa protein composed of four identical 180 kDa subunits, each with 5 different reactive sites. A2M functions as an antiproteinase by inhibiting all four classes of proteinases (including serine-, cysteine-, aspartic- and metalloproteinases). Due to this ability, A2M functions as an inhibitor of fibrinolysis and coagulation via plasmin/kallikrein and thrombin, respectively. In addition, A2M binds to many cytokines and growth factors including platelet-derived growth factor, basic fibroblast growth factor, TGF-β, insulin, and IL-1β.